An expecting mother is taken such good care of and the traditional Indian seemantham or valaikappu functions are proof of that. Even as the mother to be receives gifts and blessings, send the guests home with traditional and memorable seemantham function return gifts. 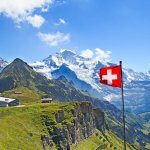 Not sure what to give for valaikappu? Find here everything you need to know about the function as well as some super baby shower return gifts. 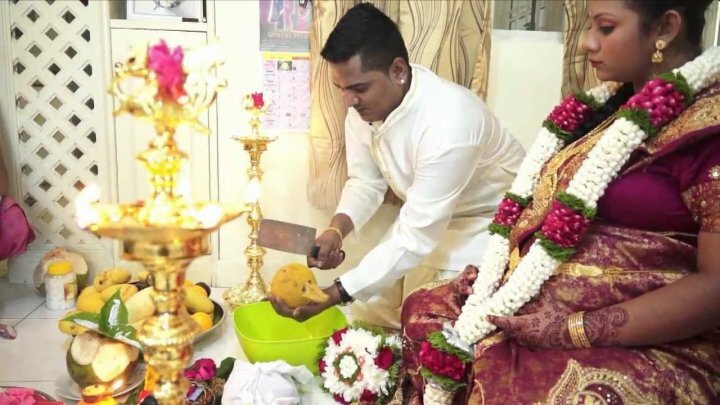 What is Valaikappu or Seemantham Ceremony? Valaikappu seemantham is a traditional pre-birth celebratory ceremony usually performed in the Southern parts of India. It heralds the birth of a newborn in a household and is marked by the presentation of red and green glass bangles to the pregnant woman which she wears on her wrists throughout the duration of her pregnancy. Seemantham literally means the parting of the hair and signifies the part of the body where Lakhshmi, the goddess of wealth and prosperity is supposed to reside. The pregnant woman therefore applies vermillion or kumkum (red powder) on her head to propitiate the goddess and ensure that the newborn child is born with all her qualities. The pregnant woman is considered to be a powerful but vulnerable being. According to traditional beliefs, she is susceptible to bad spirits and the negative effects of the evil eye. Valaikappu is a religious and cultural ceremony performed to protect the mother and the child and ensure a safe birthing. The ceremony is generally performed in the later stages of the pregnancy, often in the seventh or ninth month. The religious and rhythmic chanting is supposed to prepare the baby and the mother for the struggles to come. The woman is also bathed in cold water which prepares the baby for the birthing process. There is a probable scientific reason behind performing of the valaikappu ceremony. The baby’s brain cells start developing during the seventh month of the pregnancy. The tradition of gifting bangles to pregnant women during baby showers is beneficial to the fetus as it craves acoustic stimuli and it helps in its cognitive development as well. That apart, the gentle tinkling of glass bangles is soothing to both mother and child. The rhythmic chanting of mantras during the ceremony helps in reducing the pregnant mother’s stress and helps develop the fetus’ hearing ability. According to gynecologists, stress during pregnancy may result in the baby being born pre-term or being underweight. The valaikappu ceremony is a soul purifying process for the mother and the fetus. The whole family gathers to bless the pregnant woman and the unborn child. There is celebration, chanting of holy verses, music and wholesome food. The happiness affects the fetus in a positive way and helps the mother be calm during the pregnancy. 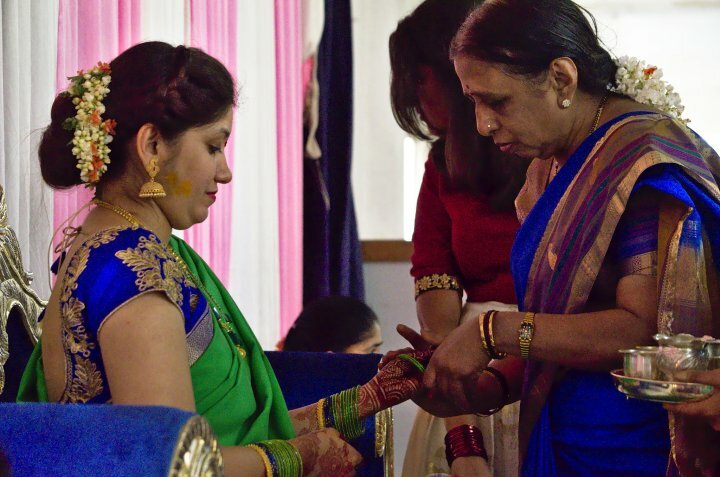 In India no celebration is complete without the blessings of the elders of the family. During the valaikappu ceremony the expecting mother gets to receive the blessings of the elders and absorb their wisdom. Important tips are given which helps them cope with pressure and pain of childbirth. The soothing music and chants helps keep the expectant woman happy and free of depression. This helps bring a healthy and happy baby into the world. 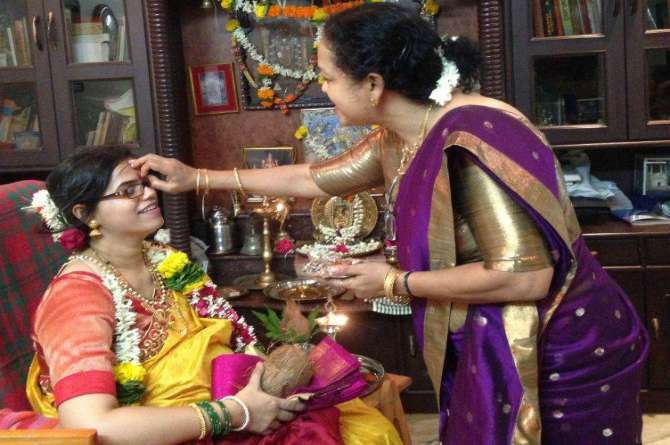 The main point of the valaikappu ceremony is to pamper the expectant mother and keep her happy. To serve this purpose the whole day is dedicated to her. She is showered with gifts and her favorite delicacies are served. All the women of the family gather to celebrate the wonderful occasion and pass on their wisdom to the young mother. It’s similar to a western baby shower in its purpose, though the execution is a bit different. The blessings that the new mother receives adds to her pregnancy glow and makes her feel special and important. To the younger generation valaikappu or seemanthan is an eastern equivalent of a baby shower. They enjoy following the traditions but also like to put a fun spin on age old traditions. We have curated a list of some fun and modern valaikappu return gifts that the younger generation will appreciate greatly. Let's be clear, seemantham is the age old tradition of having a baby shower long before the current version we're familiar with came around. Which means men and kids are kind of welcome but it's predominantly a ladies special. And what do ladies like best? Their jewellery of course! Now, if you want to appeal to the modern woman, look for pretty and dainty jewellery boxes or ones that are as cute as a button, like this Jewellery Storage Box from Big Small. Eight roomy compartments, additional pouches, a jewellery pillow, mirror, and airtight sealing to keep trinkets from oxidising while in storage, this box can be the one for many women. And it comes in three delectable designs to boot - flamingo, cacti and unicorn. Give it as is or place a few pieces of jewellery inside for guests. 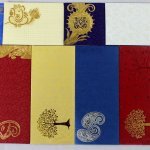 Buy it for Rs.1,499 from bigsmall.com. Every woman is a queen in her own right, but that doesn't mean she will not love being reminded of it. 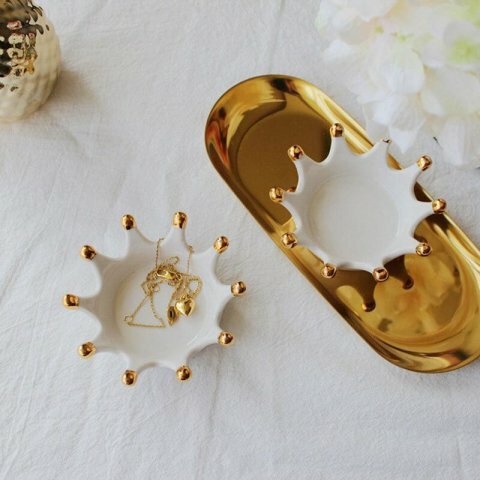 Give these porcelain Queen Jewellery Holders to your guests to hold their rings and small trinkets or just to adorn their dresser, this one is going to be a sure shot hit among the ladies. And at Rs.450 apiece, it's not going to burn a hole in your pocket either. Order this on Big Small. Flowers play a big role in just about any Indian event, from birth to marriages and everything in between. Seemantham is no different and not only is the expecting mother adorned with flowers, the sweet scent helps her relax and their beauty puts her in a good mood. A typical function room will also be decorated with fresh flowers. Why not send a symbolic floral gift home with guests? Hair clips and barrettes are hugely popular because they are so useful. Snap away stray strands, use them to lift and style hair, or clip on a pretty one to complement your outfit. Every girl you know has a stash of them at home and in her bags. Add to her collection with these charming two toned, crocheted hair clips. You will get 5 Hair Clip Flowers for about Rs.750 and there’s a shipping charge of about Rs.350. Drop one in each gift bag or a pair, the guests will be delighted on finding them. Place your order with Lia Mala De on Etsy. These will be shipped from Germany so don’t wait for the last minute to order them. Fancy a touch of gold? Then go for a more traditional hair accessory like this Damani Gold-Toned & Green Stone-Studded French Barrette. 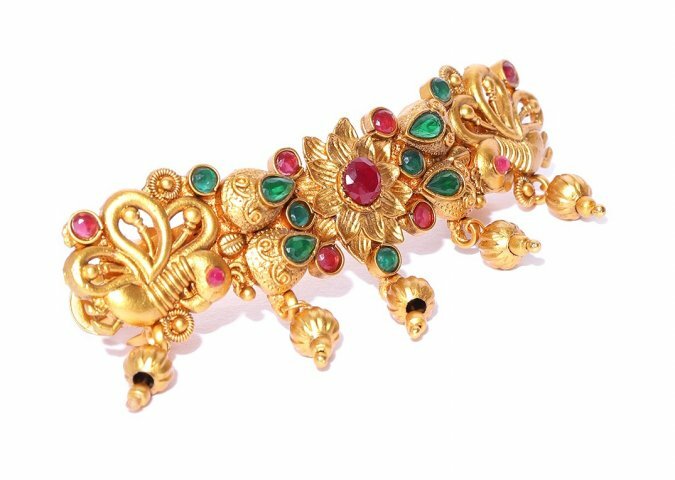 The metal clip has a floral design embellished with green and red stones and can be the perfect party hair accessory to wear with ethnic clothes. Buy this for Rs.290 from myntra.com. The Valaikappu ceremony is an important function attended by friends and the entire family. It’s a celebration of fertility and new life. Even in the baby showers of the west there is the tradition of giving the guests a little something to commemorate the occasion. Return gifts for the guests of the Valaikappu ceremony should be small but meaningful with a touch of tradition to it. A little box for holding vermillion or kumkum is the perfect return gift for valaikappu. These boxes can also be used to keep little trinkets and jewelry like small earrings. 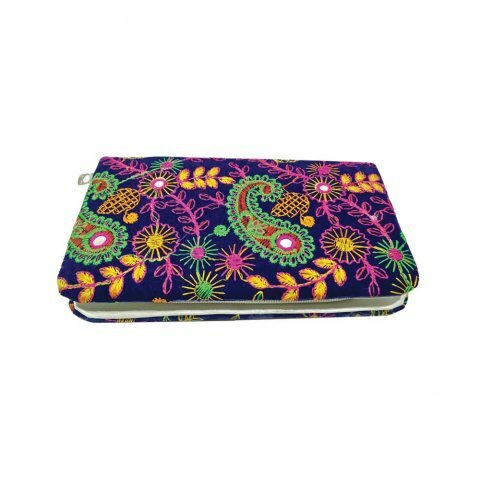 Bombay Haat Peacock Kumkum Box is a brilliantly colored piece of artistry handcrafted by artisans of Rajasthan and features a beautiful meenakari peacock design. It can used as a showpiece or used for keeping puja essentials like turmeric, rice, or vermillion. Buy it for Rs.350 from amazon.in. A bandarwal is a traditional door hanging believed to attract Lakhshmi into the household. It’s an important part of traditional Hindu ceremony decorations. 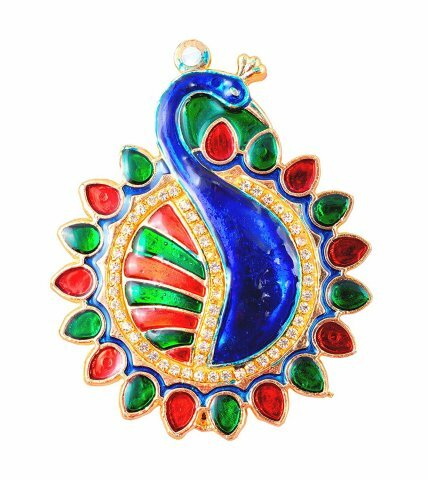 Crafticia Bandarwal Shree Namah is a royal looking piece made by artisans of Rajasthan. 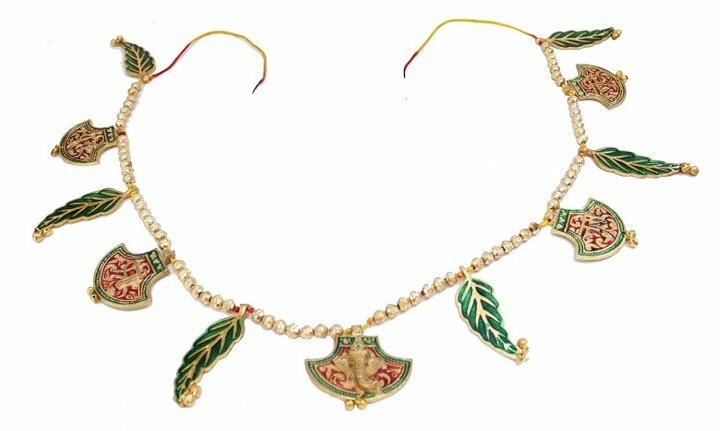 It’s made of metal with traditional colored inlay work and will definitely make a great return gift for the valaikappu ceremony. Buy it for Rs.469 from amazon.in. Pleasing your valaikappu guests won’t be difficult with the beautiful tree shaped candle stand from DreamKraft. 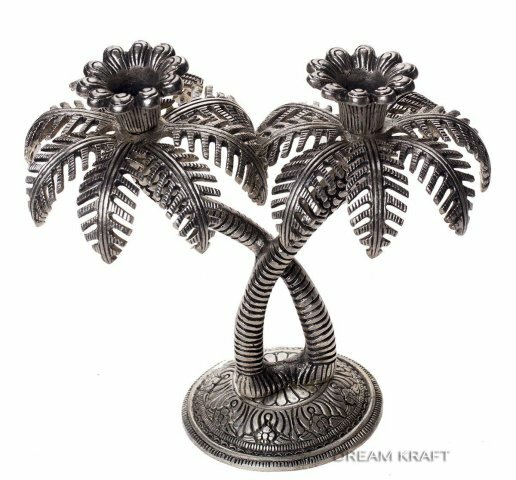 The Palm Tree Double Candle Stand can be used as home décor or for puja. 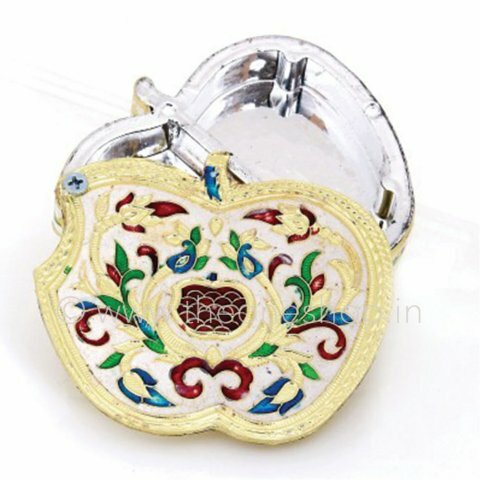 It’s made of oxidized white metal and will add a beautiful touch to any home. Buy it for Rs.439 from amazon.in. Buy the Skywalk Leaf Shaped Metal Tray from amazon.in to gift your valaikappu guests. It’s made of gold colored metal and can be used for various purposes. 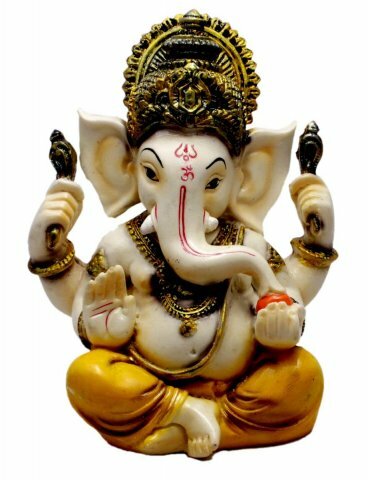 It can make a great centerpiece or be used for carrying puja supplies. Buy it for Rs.499 from amazon.in. A puja ceremony requires a variety of fruits as offerings to the god or goddess. 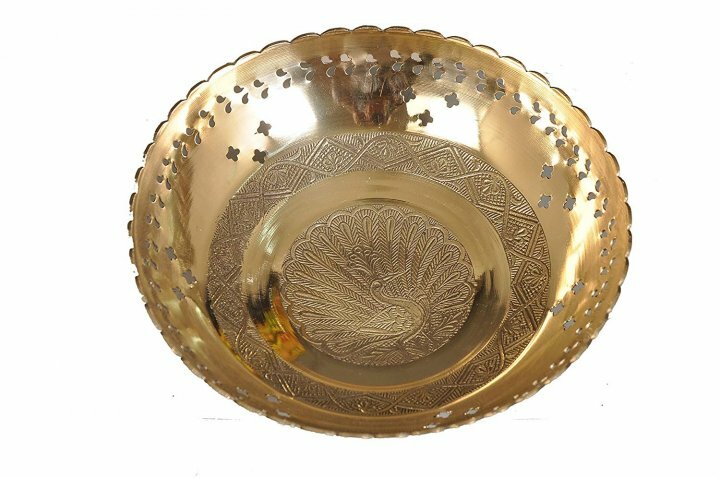 This beautiful brass fruit bowl from Nutristar will add grandeur to the celebrations and also look great in the middle of the dining table. Buy it for Rs.349 from amazon.in. Give your guests a beautiful Apple Shaped Box from theoneshop.in. This box is made of wood with traditional meenakari work. It can be used to keep dry fruits and condiments. It’s traditional with a modern twist as its design is inspired from the logo of the iconic Apple brand, the maker of iPhone, iPad and the Mac computers. Buy it for Rs.425. A pretty clutch can complement both ethnic and western ensembles. The ladies at your valaikappu ceremony will surely appreciate a return gift as beautiful as the Banjara Clutch. It’s vibrantly colored with intricate hand embroidery. You can buy it from theoneshop.in for Rs.245. Sarees are the quintessential traditional Indian wear. But what complements a saree is a beautiful blouse. Give your guests Benarasi blouse pieces from theoneshop.in. 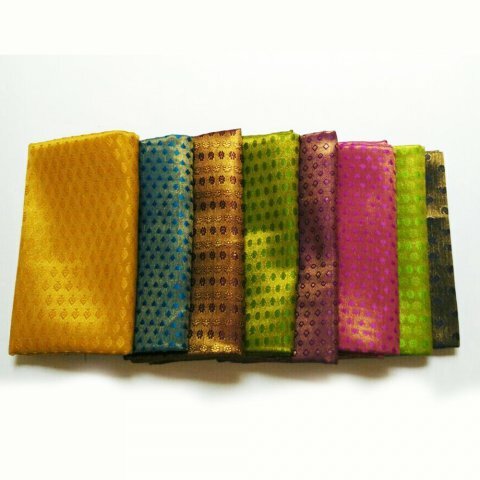 These gorgeous 80 cm long fabric pieces are available in various bright hues at Rs.85 per piece. They would make great return gifts for all the beautiful ladies who attend your Valaikappu ceremony. 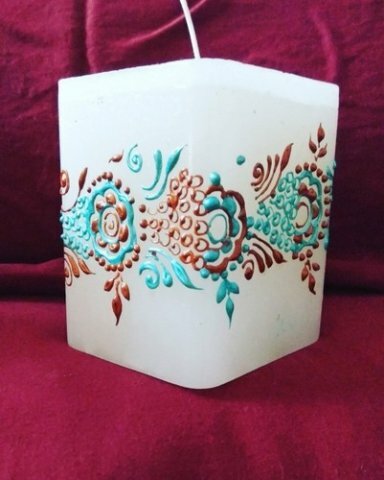 Candles are always great return gifts and this beautiful square white candle will henna design on it seems just appropriate as a modern valaikappu gift. We are certain that your guests will be extremely satisfied with a return gift as beautiful as these. Buy it for your guests Rs.200 a piece from indiamart.com. 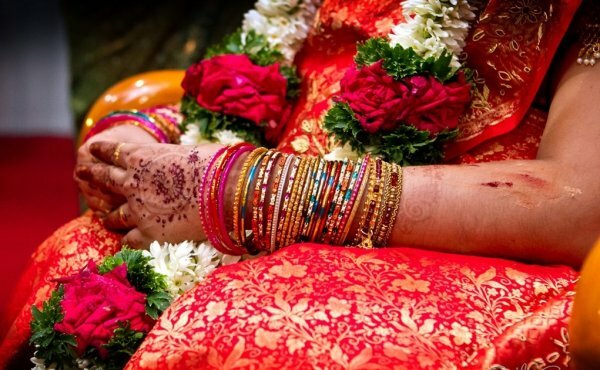 Bangles are an important part of the valaikappu ceremony. So gifting bangles to your guest would be a wonderful way to commemorate this day. Bangles not only are apt for the occasion but help complete any Indian ensemble. You can gift your guests glass bangles as per tradition. 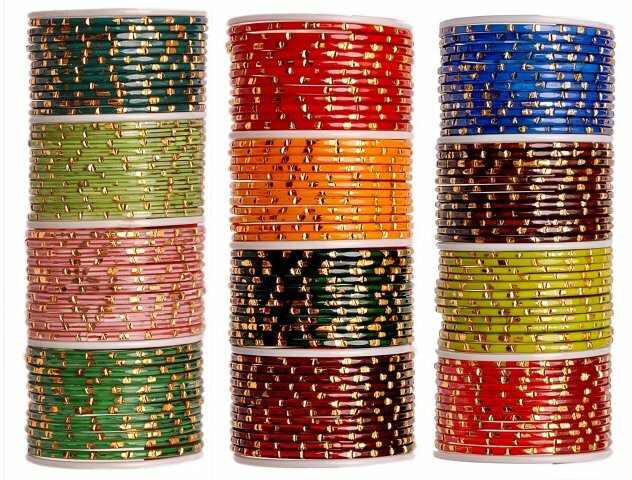 Buy New Make In India Traditional Colorful Glass Bangles from Amazon for Rs.669. For this you will get a dozen sets of bangles in 12 different colours, and each set has 12 bangles each. 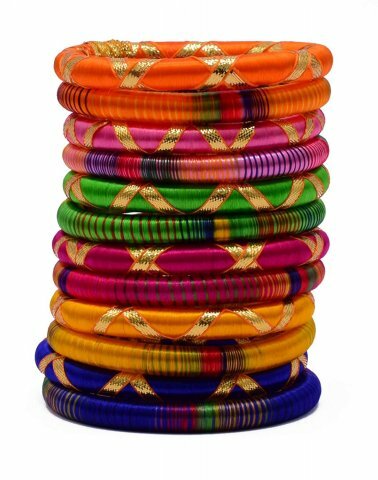 If you want to deviate a little from tradition then get the Nakhs Stylish Silk Thread Gota Work Bangle Set for Rs.240. These are beautiful brightly colored pieces which can be worn with both Indian and western outfits. These are lightweight and practically unbreakable. You will find these on amazon.in. 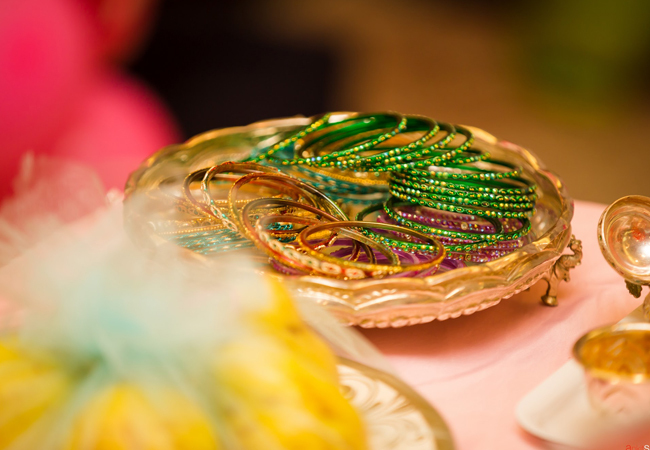 Make individual sets of bangles and give them to all the women as they arrive for the function so that each set has a bunch of colourful glass bangles to wear at the start. 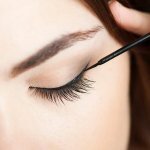 Depending on how traditional or modern the ceremony is going to be, here are a few things you may want for the soon-to-be mommy and her family. Include them in party games or as a fun side note to the traditional event! Add an element of fun by pinning these cute to-be badges on anyone who is going to have a big role to play in the baby’s life. 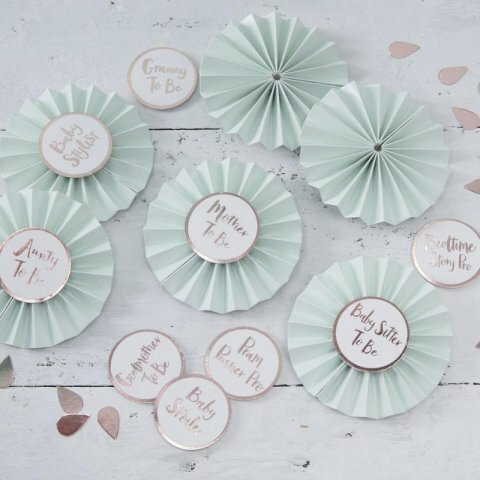 The Baby Shower Badges by Nora Katie comprise of mint pinwheel badges and white and rose gold stickers. A pack has 6 badges and 9 stickers with titles like mother to be, granny to be, baby sitter to be, bedtime story pro, baby stylist, pram pusher pro, godmother to be, aunty to be and baby spoiler. They measure 8 cm across so will sit discreetly against clothing but if you have a big family beware of ensuing drama by members to clinch one of these! As cute as they are the price is a bit of a sticky point. The stickers themselves cost about Rs.670 but shippink from the UK is another Rs.1,154. If the price doesn’t deter you, get hold of them here on Etsy. 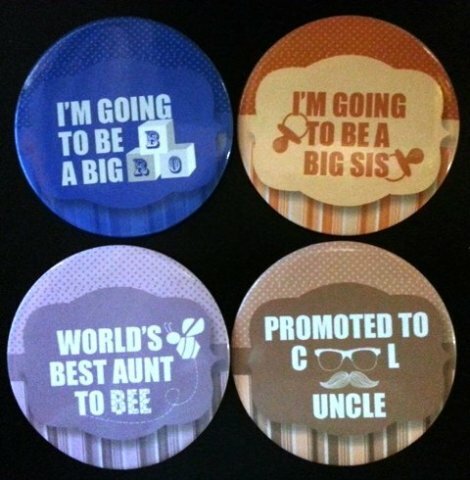 Madcaps Baby Shower Badges (Multicolour) - Set of 4 is a cheaper alternative priced at Rs.499 for a set of 4 badges if you’re keen on the idea but not the price on the previous option. The titles include I’m going to be a big bro, I’m going to be a big sis, world’s best aunt to bee and promoted to cool uncle. Get it on Amazon. 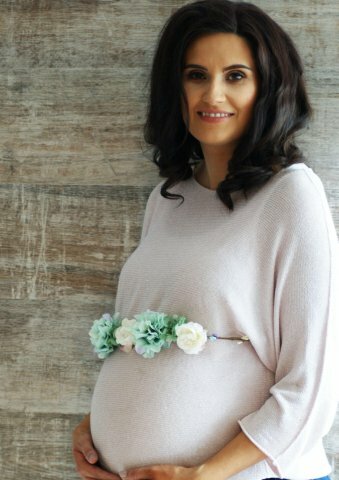 How about highlighting the baby bump with a sash of flowers? 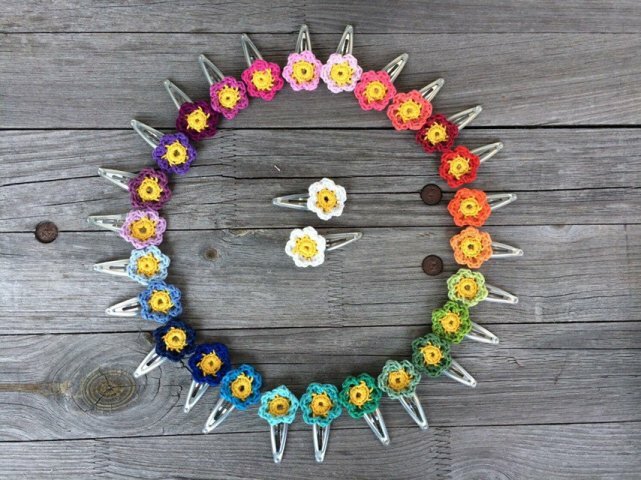 You can always make one with fresh flowers too but this pretty one with mint and white flowers sits comfortably above the bump and she can hold on to it as a keepsake. Get it on etsy.com for about Rs.2,020, including shipping charges. 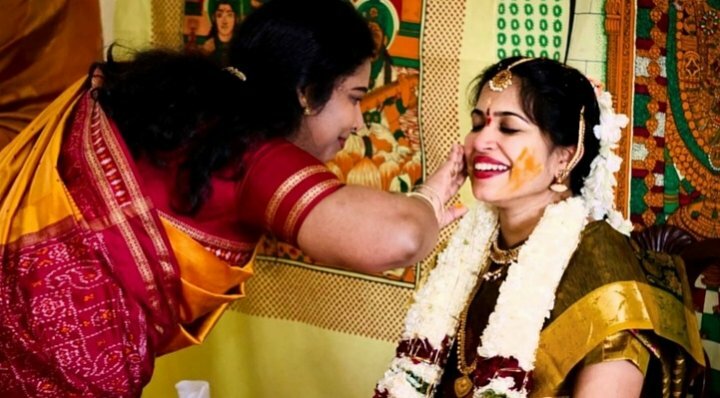 Now if the new mommy is wearing a nice kanjeevaram or a traditional silk saree, she will need something more appropriate, especially if she also has her gold belt in place above the bump. In that case this shimmery Rose Gold Baby Shower Sash will sit nicely along one side. While the sash is rose gold, the writing on it can be in white, black or baby pink so match it to her seemantham dress! Order this for about Rs.3000 from Etsy. Every culture has its own way of pampering mothers-to-be, and though the rituals may vary the purpose is the same - to prepare a woman for motherhood, give her gifts and good wishes, and honour the role of a mother. Whether you opt for a traditional seemantham ceremony, godh bharai rituals or a modern baby shower, buy return gifts that are in keeping with the mood of the ceremony and the type of guests you have coming for it.